This piece for flute and piano is based on a song I wrote for countertenor and piano to a poem by Lorca. Here is an English translation by Michael Leddy of the poem. and olives in my pack. Ah what a long way! The person who holds the position with the greatest power in the world is unable to address the issue of gun control as a possibility for preventing mass shootings like the one today in Pittsburgh because of his allegiance to the NRA. He has the audacity to blame victims for not being armed, claiming that the outcome would have been far "better" (who uses the word "better" in this situation?) if they had. It has become clear to me that the greatest power in the world now lies with the people who run the National Rifle Association. I imagine that leaders of other countries that engage in despicable activity are laughing at the person I don't want to name (I don't want it to appear in this blog). They are laughing at his incompetence and inability to provide moral leadership. They are also laughing at us, the citizens of the United States, because people in our country (and in our Congress) continue to support him. November 6 can't come soon enough for me. I already voted, using a paper ballot. This is the next installment of a video project with flutist Rebecca Johnson and pianist Cara Chowning. In light we see; in light we are seen. The flames dance and our lives are full. But as night follows day, the candle of our life burns down and gutters. There is an end to the flames. We see no more and are no more seen. Yet we do not despair, for we are more than a memory slowly fading into the darkness. With our lives we give life. Something of us can never die: we move in the eternal cycle of darkness and death, of light and life. I'm looking forward to playing "Evening Music" for a meeting of the Tuesday Morning Music Club tomorrow morning, in Urbana, Illinois, and then I am looking forward to listening to a performance of "The Collar" in the evening. 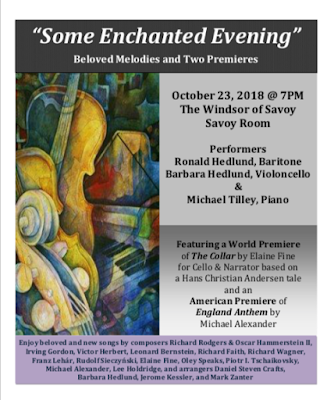 The (enchanted) evening concert, which is just south of Urbana in Savoy, Illinois, is private, but the poster is lovely, so I'm sharing it here. I feel nostalgic for the musical communities that this format of blogging made possible during its first decade, and I remember how much I enjoyed participating in long and interesting discussions on other blog posts in the musical blogosphere. Everything changed once Google Reader stopped making a lively blogosphere possible. I was an early participant (I began in 2005), and I am one of the few musical bloggers from those days who posts with any regularity. Musicians seem to have moved their musical lives to Facebook, where they can find groups of people with specific musical interests and people from their musical pasts (and other pasts) to interact with. I use Facebook as well, and sometimes I put links to posts from this blog and my Thematic Catalog blog there. Those posts are read by a relative handful of people, and "liked" by many who scroll by without reading. That is the way Facebook has "trained" us to engage. Scroll. Like. Move on. Scroll. Like. Move on. Comment. Move on. Feel disconnected. Try again. Try again later. Feel hopeful that someone will engage. Move on. Feel foolish. Feel disconnected. Rinse and repeat. It was an iPhone picture with very little in the way of text. It took very little in the way of thought, and even less in the way of effort to post. Other posts I have made on Facebook, particularly posts I have made in musically oriented forums that have links to this blog or to my Thematic Catalog blog, seem to only be seen by a handful of people. Oddly, except for birthday notices, I see very few of the posts that my Facebook friends make in my Facebook feed. It seems, in a way, that Facebook has narrowed my online social world, and it has turned social interaction into something more like window shopping. Scroll. Like. Move on. Scroll. Like. Move on. Comment. Move on. Feel disconnected. Try again. Try again later. Feel hopeful that someone will engage. Move on. Feel foolish. Feel disconnected. Rinse and repeat. There are "pages" on Facebook, and these seem to be offered for free. I "host" a few of these pages. There's one for my Thematic Catalog, there's one for Summer Strings, and there's one for Downstate Strings (my string quartet). I regularly get "suggestions" from Facebook that if I were to pay a small amount of money, those pages and the posts I put on them could be seen by a lot of people. It is the same with "events." If I want people to know about a free concert I am giving, I guess can pay money for my notice to go to Facebook feeds. I wonder if by not paying into the "service" I am limiting my ability to communicate through Facebook. I have nothing to gain monetarily through my participation in this kind of Facebook world, so I don't feel that I should throw money at the problem of not feeling engaged. Making more Facebook posts doesn't help me feel more socially engaged, except on birthdays. A Facebook birthday is something extraordinary. I think that the problem is our social interactions are being streamlined and directed by the automatons that regulate the Facebook "highway." Some of us choose to no longer engage in the social ways of Facebook. But in a post-Facebook world it is difficult to find a sense of community anywhere, even in our own physical communities. Facebook is either where the "audience" is, or we are given the illusion that Facebook is where the audience is. Now I will wax nostalgic. When we first arrived at our little university town in the mid 1980s, there was a newspaper that reported on much of what went on in town. There was an insert in the paper that listed all the concerts that were being given at the university, and there were articles promoting events. We used to write letters to the editor. Our kids used to write letters to the editor. Local people used to write columns. The paper was a big deal. The paper felt like a vital organ in our community until the early 2000s. Now our local paper is owned by a conglomerate, and aside from the obituaries, there is very little of local interest. We stopped subscribing because there is nothing worth reading. The (no longer) local paper does host a Facebook page, but it does very little in the way of creating a feeling of community for our town. I try to get out. I participate in the local university orchestra in order to try connect with people in my community. I play in a local Renaissance ensemble. In the summer I get to connect with people through Summer Strings. I go to political forums, to funerals, and to concerts. And I go to the grocery store, which sometimes provides for a meaningful social interaction. The music, written by me, is published by Seesaw and is available from Subito. 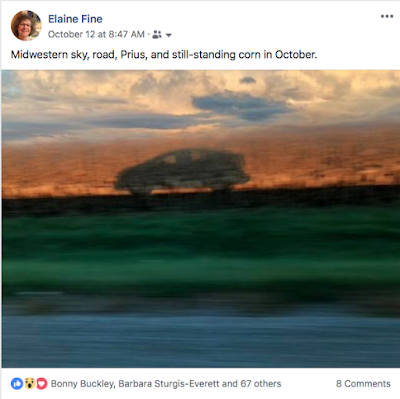 I originally wrote the piece as a setting of Frank O'Hara's poem "For Poulenc," and then re-worked it as a piece for flute and piano. This little gem, unearthed from Chapter 27 of Nabokov's engaging and enraging 1955 novel, speaks volumes. I pay special attention to the way the fingers of my left hand relate to one another (in half steps and whole steps) when I am playing the viola or the violin. I try to keep the structure of my left hand in mind all the time, and when I am teaching I pay special attention to the structure of my student's left hand. I try my best to get my student to do the same. It can be difficult to feel half-steps between the fingers when you are holding your hand in the kind of twist necessary to play the violin or the viola. The other day during a lesson I likened the experience of feeling half-steps to the experience you have when you put a piece of dark chocolate (75% cocoa is my favorite) on your tongue. At first you can barely taste it, but after a few moments of concentration (and perhaps a few drops of saliva) you "find" the flavor. I just thought I'd share this here.